We are lightweights when it comes to hiking, but still we are on the trails twice a week during the winter months in Arizona. I have a fear of heights and going along a narrow trail, climbing over boulders, or on a ridge is a true test of fortitude. This along with fear of tripping and local critters makes for a wary slow hiker. We usually hike between 2 to 4 hours and I've got to the stage when I know just how much water I need to carry depending where, and length of hike. 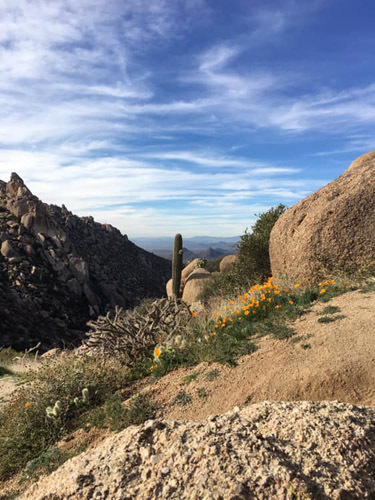 One of our recent hikes was Tom's Thumb Trail at McDowell in Scottsdale and while we didn't do the whole loop we did hike up to Tom's Thumb. It took us 2 hours to climb 2,500 feet and 2 miles to reach the top. Talk about a cardio workout and I had to take a lot of breaks to slow my heart rate down and catch my breath. According to their website this is an extremely challenging trail and I am glad to see that as I was feeling like a wimp the whole way up BUT I did it, YES!!! The trailhead has bathrooms, but NO WATER so take plenty water. Wear good hiking shoes because while the trail is well maintained it is steep with loose gravel. I really recommend hiking sticks. Here is a list of 10 benefits of trekking poles. Take along an energy bar and some fruit.